It’s amazing how time flies – the two month run of the John Thomson Exhibition is almost over. The last day is this coming Saturday 23 June – doors close for the final time at 5pm. If you haven’t already made plans to see this exhibition of large print, detailed photos of the people and landscape of Old China and Siam, you can still make it if you go in the next few days! The John Thomson Exhibition at the Brunei Gallery, London is the first to show his photos in decades – and may be the last one for many decades to come. 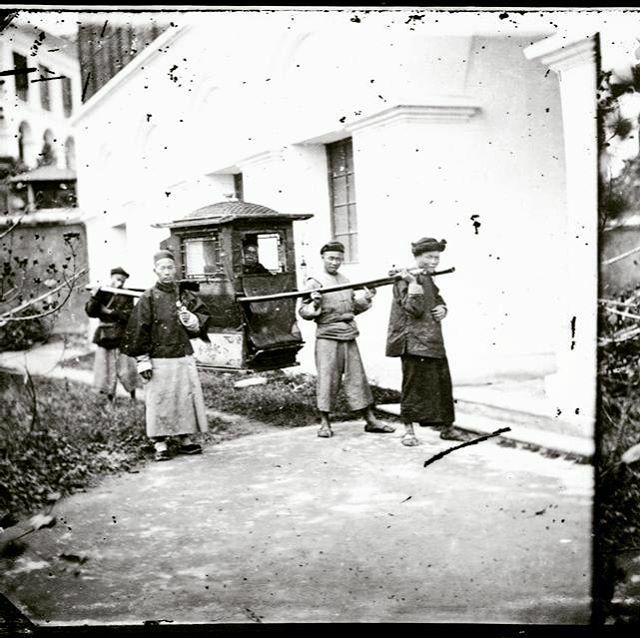 While Thomson’s more wealthy photography contemporaries like Julia Margaret Cameron and Charles Dodgeson (Lewis Carroll) were taking stylised portraits of their friends and family in the safety of their homes in England, Thomson travelled across the world in the 1860s to take unique and fresh photos of the people and places of China and Siam. The John Thomson Exhibition shows off Thomson’s images of street life as well as high born women and court officials and royalty in the diverse, vibrant East. He took these images with the latest tech of his time – a cumbersome wet collodian camera and related equipment that took many porters and pack animals to transport. The glass plates, preserved over 150 years, have enabled the exhibition curators to print enormous, almost life size prints of many of his photos. 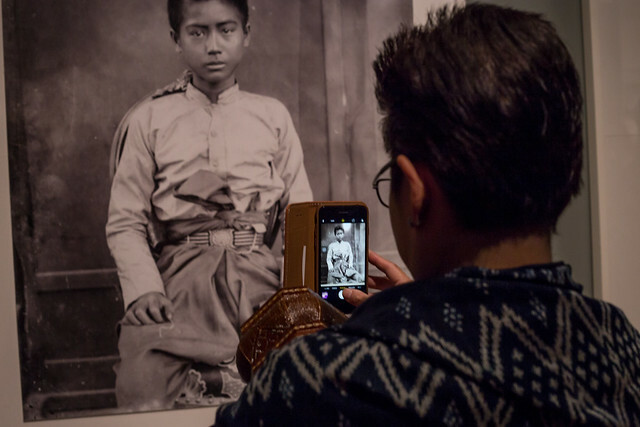 You can still catch the John Thomson Exhibition at the Brunei Gallery – it’s FREE. Make sure you go by 3pm this Saturday, 23 June! Co-curator Betty Yao says of the John Thomson Exhibition, “We had a very memorable opening to the exhibition back in April with 200 guests. Lord Puttnam gave an inspiring speech sharing his personal thoughts on the power of photography. 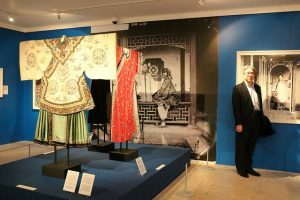 “We were honoured, too, that Mme Hu and Mme Suvanajata, wives of the Chinese and Thai ambassadors, jointly cut the ribbon to open the exhibition formally – and in the presence of John Thomson’s great grand-daughter Hilary Thomas. 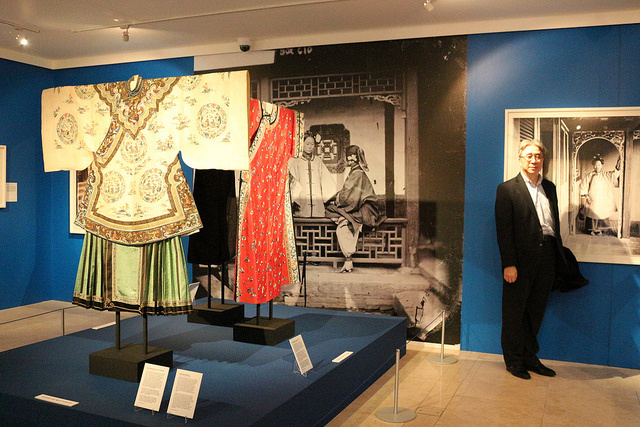 The dramatic John Thomson photos are installed with objects such as Qing textiles in the special Women’s Gallery and the royal Siamese headware in the Siam section. The exhibition gives visitors a 3 dimensional experience with these colourful and textured objects complementing the large scale black and white images. Over the course of the last two months, we saw two quite different but equally memorable public lectures by Michael Wood and Richard Ovenden and a Workshop & Study Day bringing speakers from around the world. Hollywood costume designer Lupt Utama also gave an evocative demonstration on how the textiles would have been wrapped around the body by the people of the past to create the gowns and dress that they wore in that period. We will also be continuing our support for the Just Giving fundraising to restore John Thomson’s grave in Streatham. And we will of course keep people in touch with future happenings that we will be involved in on the John Thomson front!